Despite my best efforts, I cannot keep up with all the literature out there regarding the motorized world at large. My own particular bent is toward the very early history of automobiles, motorcycles, and aircraft. I recently came upon The American Motorcycle and thought it must be a new release. Nope. This book was published in 2001 and it went right by me. I happened across author Stephen Wright at a Ventura Raceway event and saw it there. $49.95? Are you kidding me? What a deal! I had to have it and the book does not disappoint. Stephen Wright’s previous works include the terrific two-parter American Racer 1900-1940 and American Racer 1940-1980. He has restored many vintage motorcycles, has extensive knowledge, and is very good at telling a story. All great attributes for an author. 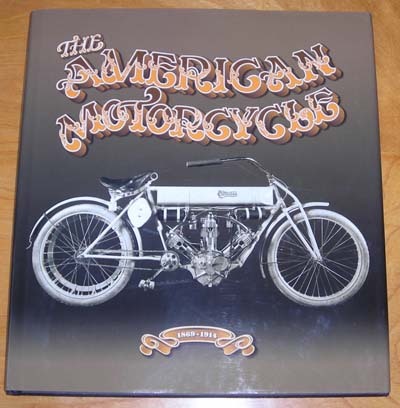 The American Motorcycle is presented in chronological order, with one or two pages given to all motorcycles appearing on the American scene. Photos and descriptions in the form of long captions make up the book. There is no text in the true sense of the word, but reading one year to the next allows a reader to easily pick out the changes in technology, approach to design, and effectiveness of each through the years. 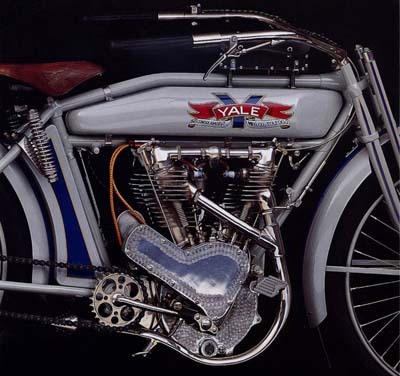 The earliest motorcycles had wooden frames and steam engines. Things we take for granted today had to be decided upon somewhere along the way. Gas tank location, seating arrangement, handle bar contour, and chain versus belt drive are just a few. Oddities, forward-thinking, and racing machines are shown in all their glory. 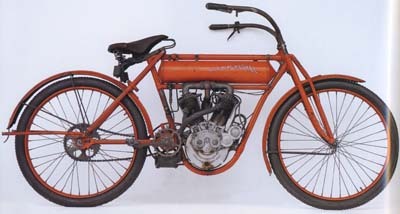 Some bikes are shown in restored or as-found condition along with hundreds of period photos. Close-ups and advertising artwork offer even more eye candy. Even with the large 11x 12 format and crystal clear photos, I found myself straining to get more visual detail. And a t time or two I got to wondering why some piece of technology was made a certain way. For example, there is no discussion of why cables were not found on most motorcycles of this era. A quick sidebar could have told the story and illustrated the mechanics of solving the problem another way. That’s as nit-picky as I can get. Wright provides enough photos and information to keep our minds busy. This was a dramatic period in American history, filled with innovators, daredevils, and the spirit to push the ever-expanding envelope. As an older publication, this makes for a wonderful find. I bought two and gave one away to a friend who also missed it on initial release. How it got by us no longer matters. 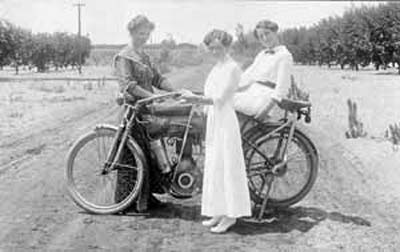 The American Motorcycle 1869-1914 shines a bright light on the people, machines, and fascinating period of motorcycle history. Then the author steps aside, tempting you to come along for a ride. Take it.